Monte Carlo eXtreme, or MCX, is a fast Monte Carlo simulation software for photon transport in 3D heterogeneous media. It uses Graphics Processing Units (GPU) for massively parallel computing and is hundreds times faster compared to traditional single-threaded CPU-based simulations. MCX is designed for generality, high computational efficiency, and excellent portability. The software can be compiled on various platforms including Windows, Linux, Mac OS, and can be used on almost all generations of CUDA-capable devices (8800GT to Fermi). In July 2012, we also released an OpenCL version of MCX (mcxcl). If you have an AMD/ATI graphics card plan to run MCX on a CPU, you should download mcxcl from MCX's website. MCX 1.0 alpha (code named "Dark Matter") is a preview of the next generation MCX software. 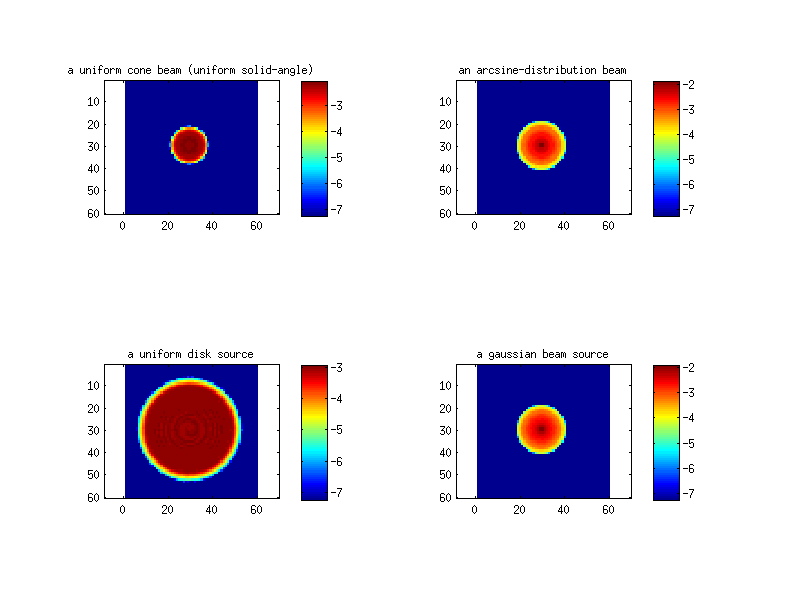 The biggest improvement of this release is the addition of 8 types of new source forms, including isotropic source, cone beam, Gaussian beam, uniform planar source, uniform disk, arcsine distribution beam, especially, the Fourier and arbitrary illumination patterns. All sources can be located outside of the volume and point towards any direction. This new feature is expected to greatly expand the applications of MCX and facilitates the development of new algorithms and systems utilizing wide-field illuminations. In addition, we also optimized the build-in random number generator for better performance, and included a number of bug fixes. In parallel to the new MCX binaries, we also release the updated MCXLAB package with easy-to-use interfaces and ready-to-run demo scripts. Please check out the new demo_mcxlab_srctype.m script to see the new source types in live. The MCXStudio GUI also received an update for all platforms. Pre-compiled MCX are provided for Windows (32/64 bit), Linux (32/64bit) and Mac OS (64bit). 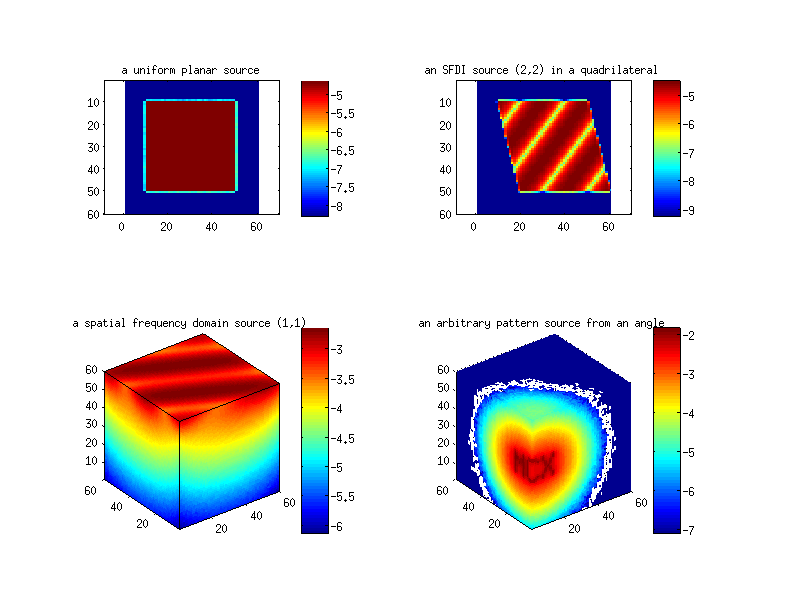 In the case of MCXLAB, mex files for both Matlab and Octave on these platforms are provided. All binaries have been tested on a Fermi GPU (GTX 590). If you download the "fermi" packages, you need to have a Fermi (GTX 4xx) or newer graphics card. This binary will allow you to use photon detection, atomic operations and shared memory buffer, originally provided by different binaries, in a single binary, and the features are switched using command line options (-R option in particular). If your downloaded package contains "cuda4" in the file name, you should download cuda 4.2.x before running MCX; likewise, if it has cuda5.5, you should install cuda 5.5 first. 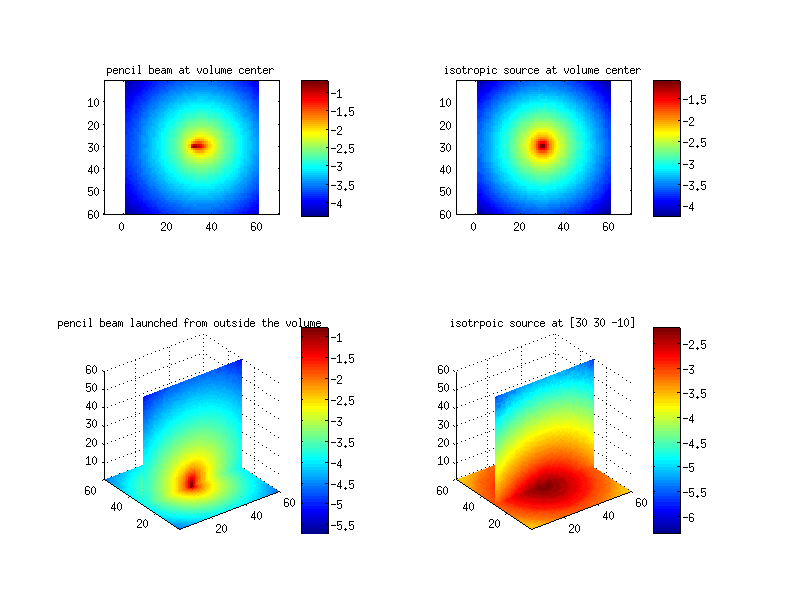 To use MCXLAB v0.9.7 in MATLAB, you must have a MATLAB pre-installed. Be careful, newer MATLAB ships with a copy of libcudart library. Make sure you the MCX version matches the shipped cuda in your matlab. the speed of this release is about 20% slower than the 0.7/0.8 series. we are exploring new approaches to improve the speed while keeping the new features.